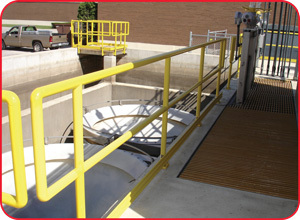 In 2008, a handrail and grating system was installed at the Saginaw, Michigan wastewater treatment plant. The installation needed to meet their requirements for corrosion resistance around the sludge basin. The installation included Strongwell’s yellow SAFRAIL™ handrail systems, DURADEK® I-6000 and EXTREN® structural shapes. All products are impact resistant, strong and particularly well-suited to corrosive environments. The fabricator, Joe Cavanaugh of Titus Welding, and the installers from Gerace Corporation were very pleased with the products as well as the ease of fabricating and installing the project.